The adventure continues here! And continues to bring surprises and opportunities for growth, learning, and healing - as well as a multitude of opportunities to experience Joy and Love. This Update brings you: the announcement of two Intensive Training Days in August - in San Francisco and Portland, Oregon; reports on the first two Intensives in San Francisco and San Diego - as well as a heads up that the Intensive in Los Angeles in July could reach capacity long before July 16th; also, the long awaited news that the audio version of Codependence: The Dance of Wounded Souls is now available on CD. I will bring you up to date on what is happening on those fronts in the Newsletter below, The major focus of my life for most of the time since the last Update however has been on the home front. Because of some difficulties, and a break up, in the relationship between my partner Susan's 17, just turned 18, year old daughter and her boyfriend - Susan and I were the primary caretakers for my precious (now 19 month old) step grandson / god son Darien for about 2 months. He is an absolutely amazing little man. You should see him dance! A Talking Heads CD is his favorite - he starts smiling as the first few notes are played, and then starts rocking out. It has been such a privilege and honor to experience his growth for the last year. To watch his personality blossom and reveal itself as he grows. Some of the lessons I have learned by interacting with this little person came into play in the first Intensive. In answering a question about setting boundaries with children, I was able to share - not only what I have known theoretically, and written about - but also was able to give an example from his behavior. Here is what I have written. "A parent certainly needs to take steps to try to control children's behavior - to keep them from eating 20 candy bars for instance, or sticking their hand on a hot burner - because that is part of the parents job. It is important to start helping children to understand that actions have consequences, and that if they violate boundaries and limits there will be consequences - but that you still love them no matter what. It is very important to give children consistent boundaries / limits - that is one way they know they are loved. It is crazy making for a child to experience inconsistent boundaries - like one does in a dysfunctional family. Now, children will test boundaries - in a way, that is part of their job - but they really want and need consistent boundaries. That lets them know you love them and are there to protect them. They may challenge the boundaries, but they truly do not want to be in control because they know deep down they shouldn't be. What I have experienced in interacting with Darien, is that when he gets over tired and hyped up he cannot stop on his own. So, he will do something deliberately that he knows is a "no-no" (like touch a plug in an electrical outlet) so that I will take him and put him in his chair with a seat belt. He sometimes gives almost a sigh of relief at being strapped in - because he feels safe then. And if we are at the store and the seat belt in the cart is undone, he will insist on having it buckled. As I say in the quote from the article, it is a child's job to test boundaries - and a parental units responsibility to set, and enforce, consistent boundaries. This little man has demonstrated for me how important this is to his peace of mind. A new resource in England has been added to the Referral to local Therapist / Counselors page. Great News! 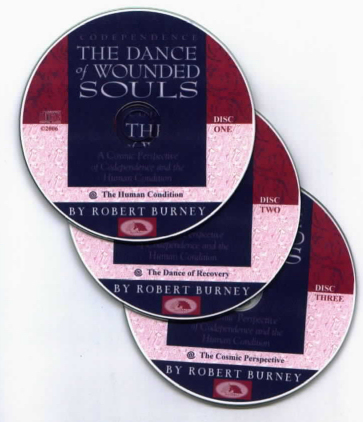 The audio version of Codependence: The Dance of Wounded Souls will be available on CD by July 1st. It will not be a fully produced, slickly packaged version - but will be one that you can listen to by popping it in your CD player. One of the challenges of getting the audio version in CD form has been the length of the recording. It runs a little over 4 hours - which with CDs of 80 minutes capacity makes it necessary to use 4 CDs to duplicate the cassette tape version. That meant, that either we would have 3 full CDs and one with less than 10 minutes on it - or that we go back into the studio and add extra material by recording enough to make the 4th CD of reasonable length. The cost of doing that - plus the cost of producing and packaging the CDs - has been what has kept me from getting it done for years. The new development that has made it possible to offer the CDs now, has to do a guy named Jeff Sohler who attended my San Francisco Intensive in April. He is a former computer programmer who has been specializing in internet marketing for some years now. He first contacted me last year about the possibility of producing the CDs. Jeff also has a lot of ideas about utilizing my writing on the site to produce audio products. He is a great believer in the effectiveness of presenting information in audio form. Jeff is also a great believer in my work - and wants to help me make it available to a much wider audience. He has ideas for helping me create a whole new version of my web site with all the latest technological wonders available - streaming video, podcasts, downloadable audio CDs, etc. Since I am ignorant of all these new developments - and still utilize a web composing program many generations out of date (stone age in internet terms) - and I have a fear of, and resistance to, change, I corresponded with him some but didn't give what he was offering me a high priority. I have also been in precarious financial position for some time, and was afraid that it would cost me a lot of money. When Jeff came to my Intensive in San Francisco, he brought me a version of my tapes on CD that he had produced for himself to listen to. He did it by dropping the introduction that I recorded just for the tapes, and slightly speeding up my voice on the first CD of a 3 CD set. When I got around to listening to them about a week later, I was amazed at the quality of the recording. There is a part of the first CD where the sound is slightly "thicker" because of the microscopic changes he made to make it fit time wise - but that doesn't detract from the presentation of the information at all. I probably wouldn't have even noticed it, if I hadn't been aware of it. The rest of the CDs are of very high quality. I started writing this Update on my CoDA birthday early in the month - so will start out with what I wrote then, and then bring things up to date on the lower part of the page. Today is the 20th anniversary of my Conscious Codependency Recovery. I am crying for Joy as I write this because I just reread the story of what happened on June 3, 1986 - and of how the commitment I made to myself that day that eventually led to my book and web site. I am so full of gratitude and awe at the miraculous and magical nature of my Spiritual Path, of my Recovery Journey, that tears are streaming down my face as I type. Here is a quote from the page in the premier issue of the Joy2MeU Journal in which I tell this story. "I date my codependence recovery as starting on June 3 1986. As with any milestone, there was recovery that occurred before that - I had been clean and sober for exactly 2 years and 5 months at the point (the story of my early recovery is for another issue) - but this particular day marked a breakthrough in consciousness to a whole new level that changed the direction and focus of my life. On that day, I broke through the codependent cycle of "shoulding" on myself about the car. I stopped beating myself up and calling myself a slob, and lazy - and just washed the car. And then I asked myself "why haven't I ever washed this car?" I said to myself - this is no way to live life, I need to change this. So that night I started to focus on changing the subconscious programming from my childhood. I didn't know how I was going to do it - but I was determined to find out. (That was an act of Love for myself that at the time I wouldn't have known to call Love.)" - The Story of "Joy to You & Me" from the The Path of one Recovering Codependent ~ the dance of one wounded soul in the Premier Issue of the Joy2MeU Journal. That installment of my personal recovery story - which I call "The Path of one Recovering Codependent ~ the dance of one wounded soul" - includes sharing how the intervention of a psychic led to the name of my publishing company - and how the DMV played a part in the name of my web site. What I realized in retrospect about that night of writing, is that I had really done the first three steps in regard to my codependency - without even knowing to call it codependency then. I cry tears of Joy because of the incredible adventure that has unfolded in my life over the last 20 years. There was no way for me to have envisioned that what began that night as a desperate pledge to learn to live my life differently, would evolve into me pioneering an approach to codependency recovery and inner healing that would help thousands of people - probably tens of thousands by now - to start learning how to be more Loving to them self. I am very proud that I had the willingness and courage to follow my path. I am also full of gratitude and humility because I was just following where I was led, going where the Spirit guided me. There have been so many miracles - and so much magic - on my path. It has Truly been a glorious adventure. An adventure that is continuing as I write this. About the only writing I have done in the last year or so, has been for these Update Newsletters. That is because my life has a different focus right now - lessons of experiencing are unfolding for me. Experiencing being in an intimate relationship. Experiences of playing the role of father figure to a precious 18 month old little boy. Experiences of interacting with a family on a daily basis. I have definitely been more involved in experiencing life in the last year, than just writing about it - as I mention was a goal in my first Update last year. There are times that I do miss the writing however and I will probably get back to doing more of it one of these days - although I don't foresee that happening in the immediate future. I do have some unfinished pieces of writing - including the one I was telling in my Journal about going to treatment and how my Spiritual Path unfolded, as well as the last article in my 12 step series. I will get to them when it is time in the Cosmic Scheme of things. As of June 15th, I will have lived with my significant other Susan - and the family she brought with her - for one year. That brings the total number of years that I have lived with someone in a relationship to a grand total of 4 years - in almost 40 years of adult life. 90% of my adult life I lived alone because of my codependency issues. (Fear of Intimacy -Ý Relationship Phobia) Pretty sad fact - very wonderful that I am now in a relationship that I believe and hope will last for the rest of my life. I started writing this Update on my CoDA birthday without knowing when I will finish it. I hope to get it posted before we leave for San Diego Saturday to do the Intensive Training Day there on Sunday. I am not sure if that is going to be possible. Due to circumstances, Susan and I have been the primary caregivers to the 18 month old baby for about the last 6 weeks. Taking care of an 18 month old takes a lot of time and energy. It has been, and continues to be, an amazing, Joyous, magical experience to interact with this little human being daily - but doesn't leave much time and energy for other things. I am also awaiting some developments in terms of announcements I hope to make with this Update Newsletter. One of those has to do with the long awaited availability of the audio version of my book on CD. I am hoping to be able to announce that a CD version is going to be available very soon - and more will be revealed about that this week. I was also hoping to announce the next scheduled Intensive in this Update. The snag that has developed in that regard is that sign ups for the Intensive in San Diego have been quite slow - and I am hesitant to schedule an August Intensive until the financial situation gets a little better. The Intensive in San Francisco was a resounding success. The attendance wasn't what I had hoped for - but was a very nice sized group with 17 people. One person flew in from Pennsylvania - and others from Washington, Oregon, and Nevada. And 4 Native women came down from Winnipeg Canada. There was even a bit of matchmaking that occurred as two people attending hit is off very powerfully during the Intensive. Expenses ran a little higher than I had expected - which led to a slight rise in the price for the next two Intensives in San Diego and Los Angeles. And it looks as if scheduling these two so close together - both time wise and geographically - may have been a miscalculation. It looks as if the Los Angeles one will be close to full, but sign ups for the San Diego one are very slow. If I lose money, or make very little money, on the San Diego Intensive, it makes me apprehensive about scheduling the next one - which would probably include air fare in the expenses. I am thinking in terms of the Pacific Northwest - Portland or Seattle. But the Intensives here in the state are going to have to generate enough income to make it sensible to think that ones in other parts of the country are worth the risk of setting up. So, we shall see. I will write this Update in bits and pieces as the week goes on - and More Will Be Revealed. So, obviously I didn't get this posted before the San Diego Workshop. The experience of the Intensive was quite wonderful. There were only 8 people in attendance, but that didn't affect the quality of the workshop - just it's financial viability. We didn't do much more than cover expenses for the trip down there - and that has me apprehensive about scheduling Intensive Training Days for any location that requires the cost of flying. Two people flew in from North Carolina, and one from Texas for the San Diego Intensive. That was after having people fly in from Pennsylvania, Oregon, Washington, and 4 people from Winnipeg Canada for the Intensive in San Francisco. 17 people attended that workshop - so it was a success in all aspects. I had actually been hoping for more, but can now see that between 15 and 20 is probably a reasonable size to shoot for at this point. We have almost that many signed up already for the Los Angeles one on July 16th - and I think it could very well fill up the room we have reserved that will hold about 25 people. The logistics of doing this have become clearer with the first two Intensives. I designed them with arranging for a box lunch to be served in the meeting room so that there would be a minimum of disruption by breaking for a meal. I have learned from past experiences, that when people go to restaurants it is very hard to get everyone back within the allotted hour to get the second part of the seminar going on time. What I have learned from the experience of these first two Intensives is how costly it can be to get box lunches from the catering departments of decent hotels. So, I have decided to drop the box lunch part of it for future Intensives - and just allow the time for people to eat at nearby restaurants. I had started out scheduling these Intensives at Hotels by airports specifically so people could fly in from out of town and just take the hotel shuttle from the airport. That aspect has proven to work well so far - and is something we will probably continue in most cases in the future. At this point, flying any distance to present an Intensive appears to be a financial risk - and investment (buying the tickets in advance and putting up deposits with the hotels) - that doesn't seem reasonable given our present circumstances. (I still haven't been able to pay all of the June rent - but hope to by the end of this week.) I don't see it happening before October for sure - and perhaps not this year. I could, of course, raise price of the Intensive to cover the extra cost of flying - but am not real comfortable with doing that at this point, not sure if it would work. We shall see how things unfold. If I hear from enough people in a certain area that they would definitely be attending, or someone wants to donate some frequent flyer miles towards our tickets to a certain city, or some other messages come from the Universe that point us at a certain location, or locations - then maybe we will be able to travel a distance to present an Intensive. My Marketing director really wants to visit Florida among other places - so if enough people on the East Coast let us know they are definitely interested, perhaps we could shoot for out of state in October or November. So, the CDs are available now! Great News! And I have set the next two Intensives for San Francisco and Portland. After the light attendance in San Diego, we were strongly considering only doing locations we could drive to for now. However, a person from Portland who attended the first Intensive was very encouraging about coming there, plus several e-mails from people in the area asking if we would be doing one in the Pacific Northwest, got my attention. As I shared in my book, I believe that "3 or more" is kind of the metaphysical equivalent of a "heads up" - a sign that my Higher Power is sending me a message. So, I did some investigation, and found that we could get an early morning flight out of San Francisco to Portland - that was already reasonably priced, and even more so with some credits I had with the airline. So, I decided to try putting on two Intensives in one weekend to minimize the travel expense. I haven't actually bought the tickets yet - (been working on getting the rent together) - and probably won't until July 1st or after. If I don't get any sign ups for Portland by then, I will consider canceling it - but I don't feel like that will be necessary. As I said, only having 8 people at the San Diego Intensive did not really affect the quality of the experience. It is a real pleasure for me to have the time to really explain my approach to the integration / inner healing work - and to share my experiences of how I learned various lessons along the way. The feedback indicates that people not only really enjoy the "tangents" I go off on when I am led into sharing a story of my personal recovery - but also to find it very helpful in understanding the process. We have a short questionnaire about the experience that we ask people to fill out at the end of the day - and several of them indicated that the "tangents" were a favorite part of the experience. I have come to realize that the end of a pretty intense day of being inundated with a lot of information is not the best time to ask people to write eloquent testimonials about the experience - but there was one from the San Diego Intensive that I really liked. Everyone who has attended the Intensive Trainings so far has indicated they would recommend it to others. And the people who have traveled long distances have been unanimous in saying that it was well worth the trip. So, hopefully the upcoming ones will be successful enough to demonstrate that it is worth the risk to travel out of state for future dates. As I indicated above, if enough people show strong interest from any specific area we will consider scheduling one in that location. I hope to announce a September location (or locations) in late July - so e-mail me if you would attend in your area, and more will be revealed about where we go from here. By the way, my 16 year old son is here visiting now - and it has gone very well. He seems to have fallen in love with the baby also - and it has been touching to watch him hold a baby for the first time in his life. Codependence: The Dance of Wounded Souls by Robert Burney is copyright 1995. Material on Joy2MeU web site (except where otherwise noted) is copyright 1996, 1997, 1998, 1999, 2000, 2001, 2002, 2003, 2004, 2005,& 2006 by Robert Burney PO Box 977 Cambria CA 93428.